EURUSD has been falling down after Yellen’s speech and today there are no economic reports in Eurozone but the US is publishing the core durable goods orders data and pending homes sales data. 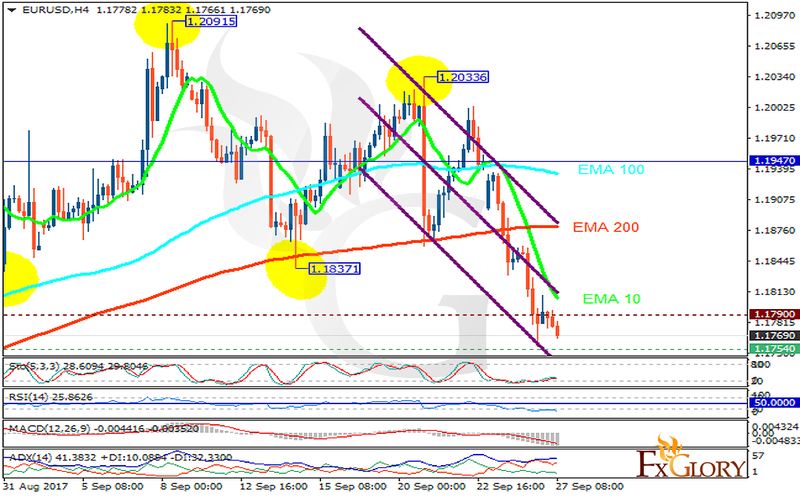 The support rests at 1.17540 with resistance at 1.17900 which both lines are below the weekly pivot point at 1.19470. The EMA of 10 is moving with bearish bias in the descendant channel and it is below the EMA of 200 and the EMA of 100. The RSI is moving in the oversold area, the Stochastic is moving in low ranges and the MACD indicator is in negative territory. The ADX is showing sell signals. The support level breakthrough will drag the price down to 1.15 area.